Pavers can easily make outdoor features beautiful and stunning because of the great design options. You can choose an Old World theme or a more modern design to suit your personality or lifestyle. These paving materials are best used on patios, driveways, pool decks, and other outdoor living spaces. Aside from the exciting designs, there are also different types of pavers that you can choose from. Permeable pavers are often used with other materials to control water runoff and to collect water for future use. With options including brick, interlocking concrete pavers and asphalt just to name a few. At Rainbow Acres Landscaping, we highly recommend permeable pavers because of their outstanding benefits. They are eco-friendly materials and effective in controlling water runoff. But to be effective, this type must be installed only by highly skilled installers. Knowledgeable installers like us can guarantee the correct installation of this particular type of paver. In addition, we carefully create a design plan, which includes site development, paver installation, and installation of other amenities. With our systematic approach, clients like you can expect gorgeous paving amenities that are also eco-friendly. Please call us at (802) 759-2225 to learn more about the permeable pavers that we can use on your property. We have already installed a lot of these pavers for our clients from Addison, Vergennes, Essex, Bristol, Middlebury, Burlington, Brandon, South Burlington, Jericho, Junction, and Montpelier, VT. If you want your driveway to look outstanding and last longer, use permeable driveway pavers. These paving materials are proven durable and made specifically for driveways. They can handle vehicle traffic and can withstand harsh weather conditions. Water runoff and flooding are also avoided if permeable pavers are used. There are two types of permeable pavement systems that can be used on your outdoor features. You can use pervious asphalt or permeable concrete pavers. The latter is the better option because of its wide range of applications. Asphalt is only appropriate for use on driveways, parking areas, and sidewalks. On the other hand, concrete pavers have limitless applications, both in residential and commercial properties. They are best used in open-type patios, outdoor kitchens, walkways, driveways, playgrounds, and pool decks. Determining the exact cost of a property improvement project is always necessary to avoid stalled projects or opting for subpar materials. One of the things that you should do is to determine the permeable pavers cost. To give you an idea, the average cost of the permeable type is approximately $4.00 to $6.00 per square foot. The figure will go up per square foot if you add the installation cost. There are also other factors that affect the overall costing of the paving project. For example, the kind or brand of pavers to be used on the project may require you to shell out more money. Likewise, the quality of the base materials used will have an impact on the cost of paver installation. If you also want to enjoy the benefits that permeable pavers can provide, call Vermont's expert paver installers - Rainbow Acres Landscaping. 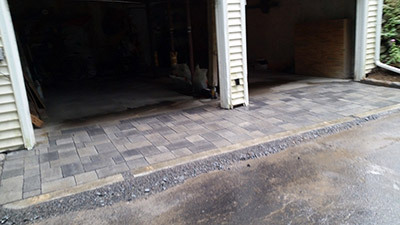 We have already installed all types of pavers, so we are confident about the quality of our work. And when it comes to permeable pavers installation, Rainbow Acres LLC is the company to contact in Vermont and the surrounding areas! Call us today.